Saturday Looks Good To Me is the songs and experiments of Michigan-born songwriter and producer Fred Thomas. Since their almost accidental genesis the band has taken on many different forms and variations, channeling widely varied influences from the history of pop music and the world all around us to sculpt a very personal, intensely honest wall of sound. The group materialized in 2000 as part of a highly conceptual project involving a record label that only put out bands that didn't exist. Fred ventured into his basement room in Ann Arbor Michigan and with various singers and musicians stopping by to add their help, emerged a few months later with nine songs of dusty, loopy Motown-inspired pop. He named the project Saturday Looks Good To Me. Nothing more than an exciting recording experiment, the songs were pressed in a super limited edition on LP, and when those were gone, they were released on CD in an equally obscure and grassroots manner. The band still existed only on records in the fall of 2002 when a phone call came in from emo-heartthrobs Saves The Day asking Thomas if he could assemble a live band to play these songs as the opening act for their US tour. A band was pieced together and thus began SLGTM's foray into the strange and dizzying world of independent music. Based on the exposure gained from that tour and an accumulating library of songs that were ready to be heard, the group signed a deal with Polyvinyl Records. Over the next three years the band would tour constantly and release two albums with Polyvinyl, "All Your Summer Songs" and "Every Night", both met with critical acclaim, top ten lists, and the love of a growing audience. The name "Saturday Looks Good To Me" became a blanket moniker for whatever the people involved in the group wanted to present at that moment. Under Fred's schizophrenic guidance, the band morphed through styles, sounds, shuffled memberships and a constant re-working of anything once familiar. The band put out shopping carts full of limited edition 7"s and CDRs with tiny indie labels, and took every show as an opportunity to try out something new. From Beach Boys-worshiping mini-symphonies to Jackson 5 soul pop, one-time only special guest singers or extended freaked out guitar solos, each performance and new recording offered another element of the band's musical palate. Fans would sometimes be shocked or even alienated by these experiments, which at times stood in heavy contrast to the albums. It's always weird when you expect one thing and are handed another, but the band's attempts to challenge themselves and make really valuable music comes with a need to challenge their listeners as well. How many times have you seen a band that sounded like their record and nothing else? Probably too many. In this time, SLGTM was striving to make records so meticulous and deliberate, it would be almost impossible to play them live. The live show became it's own thing, and the people who could appreciate it did so and became friends as well as fans. Following fourteen near-consistent months of touring at the end of 2005, the band withdrew from the public. Playing only a few dates in all of 2006, time was spent concentrating on writing new songs and pushing the limits of what had already been done. The result is "Fill Up The Room", a powerful song cycle linking love, death, loss and wonder in eleven sonicly overflowing parts. The record took over a year to complete, with recording sessions in Sweden, Portland, Benton Harbor and the groups familiar home of Warn DeFever's Brown Rice studios in Michigan. "Fill Up The Room" also marks the bands first recordings for K Records, a long-time source of inspiration as one of the first truly indie labels ever. The match is perfect. Without ever straying from the goal of making perfect pp songs, this record draws deeper into a vault of personal feelingand intimate musical expressions, taking risks and trying to be as honest as possible. All the sounds are warm and urgent, joyful and kind of nervous, like an eerie celebration that starts right after something really horrible has happened. Lush string sections and electric piano lines dance with washed-out samples and bits of tape collages. Bouncy Smiths-like guitar lines stop abruptly and give way to White Album-esque melodies. Wordless voices rise up at once then fall away, everything has it's place. The lyrics and music both have shifted from the girl group melodrama of earlier records, replacing it with naked songs drenched in surreal joy, swimming pools with lightbulbs broken at the bottom, the end of the world in two lovers wrapped around each other on a rainy afternoon, houses made of books written by birds, all on fire. The band will tour before and after the September release of "Fill Up The Room", hitting all of the States and Europe multiple times. The live shows as of late have been the best the band has ever done, with new members Chris Bathgate and Ryan Howard joining Scott Sellwood, Juan Briz Garcia and Fred in an instrument-switching, hyper energized articulation of these songs of love, death and the ever-popular rock and roll. 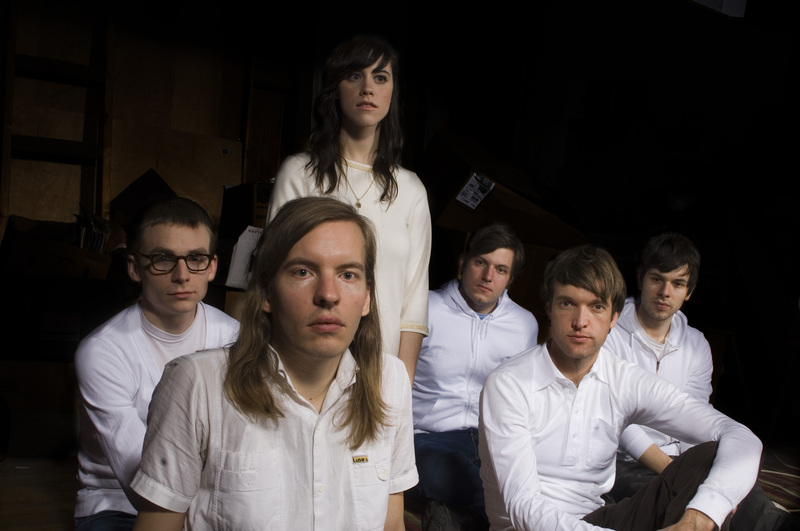 The group plans on a continued slew of seven inches and other limited releases, including a one sided 12" just for the spring tour called "Green Mansions" and a limited LP of exclusive and slightly creepier jams called "Cold Colors", scheduled to come out on Polyvinyl a few months before "Fill Up The Room" drops.